Today, the Ontario government released its annual budget. One thing that might be missed is that the government has failed to deliver on a promise to support electricity conservation made in its election platform. In the last election, the Ontario PC’s made a promise to move “conservation programs to the tax base”. In their platform, they budgeted $433 million per year to meet this commitment, which is roughly the annual cost of delivering electricity conservation and demand management programs under the previous government’s Conservation First framework from 2015-2020. Thus the promise was never to cut electricity energy efficiency programs, but to shift costs from electricity ratepayers to the government books. On March 21, 2019 the government announced a wind-down of the 2015-2020 framework, which included a significant budget cut. The roughly $400 million per year funding envelope until the end of 2020 was reduced to about $200 million on an annual basis (or $353 M for the 21 months remaining). This is a 50% reduction in funding. However, in this announcement the government also noted that it was making legislative changes to enable the Independent Electricity System Operator (IESO) to “accept tax base funding to fund conservation in the future”. So, I was watching the budget to see if taxpayer funding would replace the budget reductions directed by the government. The budget did not provide any new funding. Which means these are real program cuts, which is not what the government promised in the election. What are the consequences of a significant reduction in electricity conservation in Ontario? 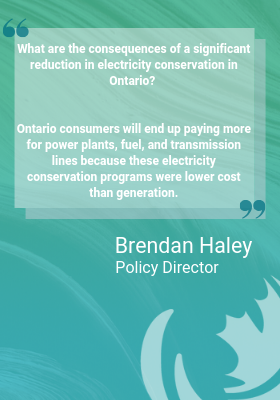 First, Ontario consumers will end up paying more for power plants, fuel, and transmission lines because these electricity conservation programs were lower cost than generation. In 2016, it cost 2.2 cents for Ontario programs to save a kilowatt-hour. In comparison new natural gas generation costs or nuclear refurbishments range from 8-24 cents/kwh. 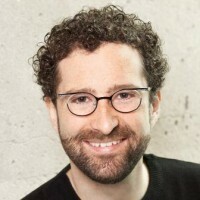 Second, as demonstrated in the Environmental Commissioner of Ontario’s last Energy Conservation Report there could be a significant increase in greenhouse gas emissions. This is because less conservation will increase natural gas fired generation, and this natural gas burning could significantly offset some of the GHG reductions the government aims to achieve through its laudable plan to increase natural gas heating conservation. As explained in our backgrounder document, moving from ratepayer to taxpayer funding could have a number of unintended consequences. It is important that energy conservation programs are fully integrated within our electricity and natural gas systems and that the budgets and savings levels are determined by what is most cost-effective for energy consumers. Moving to taxpayer funding could result in replacing the cost-benefit analyses that determine how much should be spent on conservation with an annual political decision made in the budget. It appears that Ontario now has the worst of both worlds – arbitrary budgets caps that make Ontario consumers pay more for electricity generation without offsetting contributions from the provincial treasury, as was promised. What comes next? This could only be temporary until a post-2020 conservation plan is formulated. This plan will be informed by an integrated gas and electric “efficiency potential study” which will estimate the level of energy conservation that is lower cost than generation alternatives. It will be important to maintain an independent and methodologically sound estimate of the full cost-effective potential. If more energy conservation is cheaper than energy generation, the budgets and savings targets should be increased! Of course, taxpayer funding for more conservation could help support additional policy objectives, such as more emission reductions, more competitive businesses, lower poverty rates, and more jobs. Hopefully the uncertainty created by arbitrary program cuts and the uncertainty of whether taxpayer funding will be provided will be short-lived. An immediate 100% tax write off of investments in clean energy and energy efficiency related equipment, through the Ontario Job Creation Investment Incentive. Consideration of seeking advice on building codes through working groups rather than a provincial agency, following recommendations from the Agency Review Task Force.